mountainous border for a fifth consecutive day. 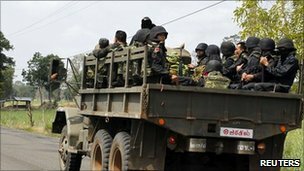 Spokesmen from both sides said skirmishes broke out near the Preah Vihear temple on Tuesday. The violence follows four days of fighting around the temple of Ta Krabey, 160km (100 miles) to the west. At least 12 soldiers have been killed in the latest outbreak of violence between the two neighbours. The 11th Century hill-top temple of Preah Vihear is a particular flashpoint. people were killed in clashes around the temple in February. There was no information on whether the most recent exchange of fire at Preah Vihear had caused casualties. Some 36,000 people have been displaced by the fighting, and the UN has called for a ceasefire.